A week ago, Jenni and I learned that our baby, due March 2014, had miscarried. I can’t express in words the kinds of emotions I’ve been experiencing for this last week. The closest thing I can think to say is that our hearts are broken, but our faith is strong. I’ve been trying to come up with the appropriate arrangement of Count Your Blessings for several weeks, and before last week, nothing I tried felt right. I attempted numerous times to come up with something that worked for me, but it just wouldn’t click. If I can’t get a spark in a piece, I can’t publish it. I just can’t bring myself to do it. If there’s no spark, the arrangement doesn’t leave my computer. That’s what was happening with this one. Then we got the news. The first day, I took the day off to be with my family. When things like this happen, the most precious things in life suddenly become even more dear to me. The next day wasn’t easy, but I knew I had to keep going. 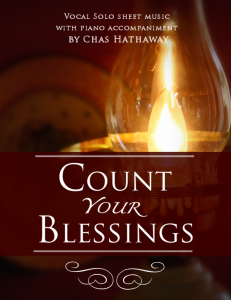 When I sat down to make another attempt at “Count Your Blessings,” it came so fast and effortlessly that I’m confident I had help. It was so different than all my previous attempts, but this time, it sparked immediately. As I’m sure you can imagine, I’ve never struggled to record my voice as much I did with this piece. In order to even get through it, I had to force myself to not think about what I’d just been through. Have you ever tried to force yourself not to think about something? Let alone something this big? Anyway, it got me thinking about the words a bit. How exactly does a cheerful, optimistic person (like I’m always striving to become) deal with tragedy? How do I see the upside, or silver lining, in the loss of a loved one? How do I find happiness in that? Well, one way, at least, is simply this: to count my blessings. I have the most loving, beautiful wife in the world, and the sweetest, funnest kids in the world. I’ve been blessed with an absolute certainty of the truthfulness of the gospel of Jesus Christ and the eternal nature of the family and life itself. I’m so blessed. Sheet music and MP3 for this piece are available on my website.